The Medical Examiner's report on the man's death states that he was taking his lunch break and had gone into the trench for lunch when the wall collapsed on him. A 51-year-old husband and father of three children has been identified as the construction worker crushed by a six-foot concrete wall in El Cajon Monday. Fernando Martinez, 51, was digging a trench with another worker at the site of a new car dealership when, shortly after 12 p.m., the wall - estimated to weigh between 5,000 and 6,000 pounds - collapsed onto the pair. One worker managed to escape and suffered non life-threatening injuries. However, the wall toppled onto Martinez, trapping him underneath. An hours-long rescue effort turned into a recovery effort, and rescue crews pulled out Martinez's body. Cal/Occupational Safety and Health Administration (OSHA) has opened an investigation into the fatal accident. 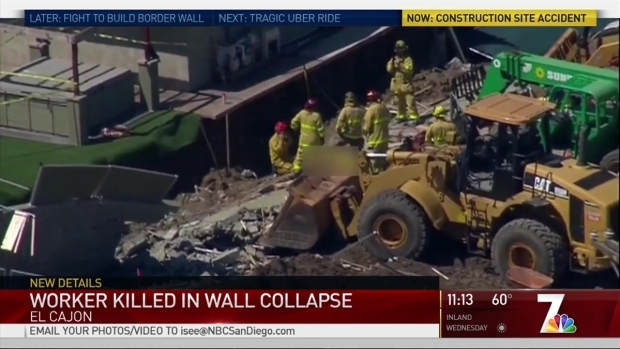 As NBC 7's Dave Summers reports, workers were digging a trench along the back side of several residences when the six-foot concrete wall toppled onto two workers in the trench. The ME's report on Fernandez's death states that he was taking his lunch break and had gone into the trench for lunch when the wall collapsed on him. No cause of death has been released. Martinez was a 30-year employee of Southland Paving Company, his family said in a statement. "Fernando was all smiles and always had a funny story to brighten your day. Please pray for his family and help his wife and three young kids in the expenses to come," read a statement on the GoFundMe page. A GoFundMe has been set up for the family. Click here to donate.